It says that Laughing is the best medicine in whole world. I think it’s true, because when people laughing for at least that moment they forget their all problems of life. 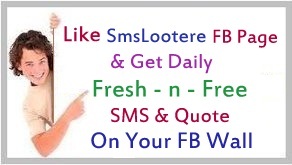 All people and Specially SmsLootere.com team says if you can bring a smile to anyone’s face you will feel world best, especially Man are always try to do something to make girls smile and girls try to do something special to see her boyfriend smiling but how? There are many ways to make people smile but the problem is you can’t just to be together all the time than how it’s possible? 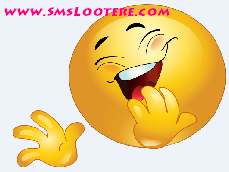 So we all know this is the world of SMS and the best way to be in touch all the time with all our near ones, so here we have some awesome collection of Funny SMS quotes in English so you can share this collection to your near ones and make them smile. Every Girl has only 2 Problems. She will surely Remember You only when She is again in Trouble..! But They would Kill U if U Forget their Birthday. A Good Girl Always Forgives her Boyfriend When She’s Wrong.. Boy: Hey, U Look Gorgeous. Girl: Thank U, Dear Brother. I See Your Face when I am Dreaming..
That's why I always Wake Up Screaming..! This Describes Everything U are Not..
A Stupid Boyfriend Thoughts Lol means ‘Lots Of Love’. ‘You are Only Girl of My Life….Lol’. When a Boy is in Love, Everybody knows Except the Girl. Just Try it and Reply Me. Ina Dictionary, First Comes Divorce, then Marriage. Laughing at Your Own Txt b4 You Send them because You are so Damn Funny. So that I can Continue to Txt You some Romantic Txts..
That Awkward Moment, When People Ask – Are You a Couple..? And You Look at Each Other and Wait Who’s Going to Answer First. Guys, if I Install Windows 7 of 32 bits Two Times then will it become 64 bits? Another Girl Replied – Yes, but it will also become Windows 14. Your Ex-Girlfriend Asking if U can still be Friends After a Break-Up..
A Kidnapper Telling U to keep in Touch..!! We don’t Pay for having “Brains”, We only Reward You for Using them “Intelligently”. Who are too LAZY to Read the Above Number..
Now don’t Laugh at Urself .. Need a Friend? Text Me. Need a Laugh? Call Me. Need Money? This Number is No Longer in Service. Boy – Our Principle is so Stupid. Girl – Don’t You Know Who I am? Girl – I’m Principle’s Daughter. Boy – Do You Know Who I am? Boy – Good (walk away). Teacher – Why You are Late? Boy – because of a Sign down the Road. Teacher – what does a Sign have to do with Your being Late? Teacher – ‘I Killed a Person’ Convert this into Future tense. Student – the Future tense is ‘You will Go to Jail’. A Failed Businessman to His Fat Wife – You are My only Investment in Life that has Doubled.